In the early going, it looked as if the Yankees were on their way to an easy victory, but as if often the case in this rivalry, nothing is ever that simple. After the Yankees jumped on Daisuke Matsuzaka for five runs in the first inning, the thought of Jonathan Papelbon toeing the rubber in the ninth probably seemed far fetched to even the most ardent Red Sox fan. However, there he was, warming up with a two run lead and the Red Sox on the verge of finishing off an incredible comeback. A pair of two run homeruns later, Papelbon had in deed thrown the last pitch in an amazing reversal of fortune, but it was the Yankees who were celebrating instead. 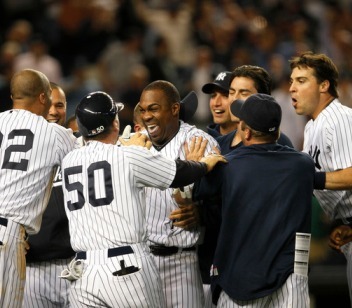 The Yankees celebrate their first walk off win of the season (Photo: AP). Entering the game, the scouting reports suggested that Matsuzaka was throwing more fastballs, which would be a change from the breaking ball approach he has used in his major league career. And, in fact, that’s exactly what he did in the first inning. The only problem was the fastballs were flat and poorly located. By the time the first batter was retired, the Yankees had five runs and Matsuzaka was forced to revert back to his tentative approach of pitching around the strike zone. Meanwhile, Phil Hughes seemed to possess the same dominant stuff as he has all season, but without pinpoint command. Even in innings when the side was retired in order, several long at bats by Red Sox hitters made Hughes work very hard. Eventually, his elevated pitch count came to a head in the fifth inning, when after retiring the first two batters on three pitches, Hughes couldn’t slam the door on the inning. Marco Scutaro extended the inning with a single on the seventh pitch of his at bat before Dustin Pedroia doubled down the leftfield line on the tenth offering he saw. Then, with runners at second and third, J.D. Drew drilled a 1-2 cutter into the right field stands to bring the Red Sox to within 6-5. Hughes wound up throwing 28 pitches to get out of the fifth inning. The protracted inning raised his pitch total to 104 and sent him to an early shower. Matsuzaka wasn’t even able to make it through five innings. The enigmatic righty wound up departing the game after only 4 2/3 innings, setting up a battle of the bullpens in the second part of the game. Unfortunately for the Yankees, both Joba Chamberlain and David Robertson were unavailable, meaning Girardi had to rely on the backend of the staff to get the ball to Mariano. After Boone Logan surrendered a Victor Martinez home run in the sixth, Girardi called upon Chan Ho Park to not only get through the seventh, but the eighth as well. Park, who had been on the DL since April 13, seemed to run out of gas in his second inning of work, and wound up giving up back-to-back homeruns to Kevin Youkilis and Martinez before being relieved by Damaso Marte. After trailing for the entire game, the Red Sox entrusted their newly gained 9-7 lead to Daniel Bard, who had no trouble handing the ball off to Papelbon. Before he would get a chance to close out the game, however, the Yankees still had to keep the Red Sox off the board in the ninth. Marte started the inning, but soon ran into trouble. With runners and first and third and two outs, Girardi then called upon temporary long man Javier Vazquez to keep the deficit at two. The last time Vazquez was summoned from the bullpen at Yankee Stadium, he gave up a grand slam to Johnny Damon in game 7 of the 2004 ALCS, an event that has haunted him to this day. Although the stakes weren’t as high this time, it was still a key point in both the game and Vazquez’ season. Javy struck out Youkilis on a slider to preserve the two run deficit and walked off the mound to the unusual sound of cheers. Papelbon’s pursuit of his 23rd consecutive save ran into an early snag when Brett Gardner worked the count full before slashing a double to left that just eluded the diving attempt of Darnell McDonald. Papelbon recovered to retire Mark Teixeira on a deep fly ball to right center, but then surrendered a game tying blast to Arod, who sent a first pitch fastball clocked at 94mph into the visitors’ bullpen. Despite the blow, Papelbon kept firing fastballs in the next at bat to Cano, who just got under one and lofted a fly ball to center. Francisco Cervelli was then hit by a pitch, setting the stage for Marcus Thames. Once again, Papelbon remained aggressive and let fly with another first pitch fastball, but Thames redirected it into the leftfield seats. The walk off win by the Yankees erased what would have been a very frustrating loss, especially coming off yesterday’s collapse to the Twins. It also helped to overshadow some of the ball clubs growing warts, which include a depleted bottom of the lineup (although Thames would beg to differ) and shaky middle relief corps. While the Yankees have some leeway to deal with their mounting concerns, the Red Sox do not. In addition to being tagged with a very tough loss, Boston also has to face the reality that Matsuzaka may never realize his potential. Furthermore, the team’s shaky defense continues to call into question the run prevention strategy upon which it was built. At some point, the Red Sox will need to beat the better teams in the American League, and last night would have been the perfect time to start. Now, they have to hope Josh Beckett can turn himself around in time to face C.C. Sabathia. Otherwise, Boston will be riding another losing streak into a tough stretch of games against the Twins, Phillies and Rays. Javier Vazquez’ win was his first at Yankee Stadium since August 6, 2004. Before Alex Rodriquez’ single in the first inning, Daisuke Matsuzaka had held opponents hitless in their last 22 ABs with bases loaded (dating back to the start of 2008). Jonathan Papelbon surrendered two home runs in the same inning for the first time in his career. It was also the first time he had surrendered two home runs in one game since making his major league debut as a starter on July 31, 2005. The Red Sox five homeruns were the team’s most long balls against the Yankees since also hitting five on April 22, 2007. In the top of the seventh, the Yankees retired Dustin Pedroia on a 4-6-3 double play that started when Robinson Cano smartly let a short pop up land at his feet instead of catching it in the air. After the game, Joe Girardi reported that Joba Chamberlain was not available because he threw 23 pitches on Sunday and warmed up twice on Saturday. Girardi also stated that Javier Vazquez remains on track to start against the Mets on Friday. It must be very frustrating for a Sox fan to watch Papelbon throw nothing but fastballs..after A-Rod hit one 400+ feet wouldn’t he try and mix it up with Thames? Where was V-mart during all this? Sox are not an impressive team right now..here’s hoping we chase Beckett tomorrow as well. Dice-K..just not the same guy I watched in Japan. No analysis to back it up but seems obvious that pitchers here are so abused when young that by their 30s there is nothing left..
Papelbon has been trending more and more toward being an exclusive fastball pitcher, which really isn’t a good sign for the Red Sox. Somewhere along the line Papelbon decided to dial back on the splitter (maybe strain on the arm), which I think has made him much more hittable. Dice-K has really been an enigma. Your point about the early workload could be a big part of the problem, but he is still throwing with the same velocity as when he entered the league. I just don’t think he has ever learned to throw his fastball to major league hitters. Do all Japanese pitchers prefer throwing breaking balls? Papelbon’s splitter mysteriously disappeared last season and certainly did not return last night. It was always a very difficult pitch to lay off of behind in the count. Who knows what has happened? But he is a different pitcher without that pitch. And is it just me, but I find the excuse for not putting Joba in that game pretty lame. Joe could have let Marte face Drew to start the 8th and given Joba Youklis and Martinez from his weaker (left) side. That would have been 2/3 of an inning. You just can’t roll the dice with Chan Ho there in a one-run game in the 8th inning, especially after Chan Ho is just coming off the DL and already gave you the 7th. I also don’t like the excuse for not using Joba. Also, I’ve been thinking back and can’t recall when Joba would have been warming. Andy pitched 6 1/3, so the only time he should have been up was during Robertson’s and Marte’s 1/3 in the seventh. After that, the Yankees took a 7-0 lead, so there would have been no need for him to warm again. Even if Joba did get warm twice, it calls into question Girardi’s handling of him in that game. It really makes little sense to warm Joba, but then let Roberston and Marte get two very important outs, especially if you know that will pretty much wind up counting as an appearance anyway. Basically, Girardi wound up wasting Joba in both games. They got away with the error both times, but these are the kinds of moves that eventually cost the Yankees a win.